Morning time at leisure, later in the day start driving to Delhi. Evening time enjoy exploring lcoal market around cannought Palace and Janth. Night at hotel. Early morning transfer to the train station to board your train to Amritsar. On your arrival at Amritsar train staiton, recieved by our representative and transfer to your hotel. Have your lunch. Later enjoy trip to Wagah Border to watch Border Retreat Ceremony. The pageant of the beating of the retreat and the change of guard within handshaking distance of the Indian and Pakistani forces here makes the most charming of the spectacles as a daily evening drill. Ascertain the timings before you leave to see this spectacle since these are changed seasonally. Wagah is the only land border open between Pakistan and India. Night stay in at hotel. After breakfast at hotel. 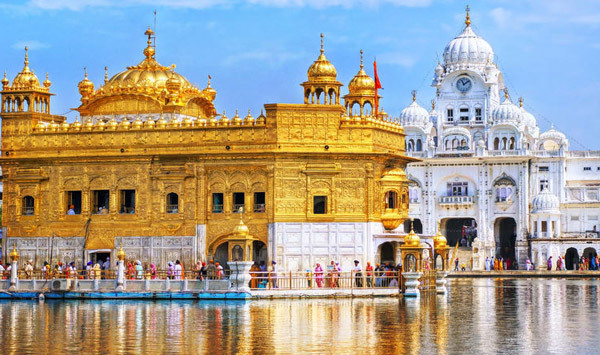 Visit Golden Temple, the most sacred temple for Sikhs. It is a symbol of the magnificence and strength of the Sikh people all over the world. In the evolution of the Darbar Sahib, is entwined the history and ideology of Sikhism. Also, visit Jallianwala Bagh- Martyrs’ Memmorial built in the shape of eternal flame of liberty is situated on the outskirts of Golden Temple. Afternoon transfer to the train station to board your train to Delhi, Meeting and assistance upon arrival in Delhi and transfer to your hotel. Night stay in Delhi.